My first visit to India—after adopting the Sikh faith—was in 1980. We went to visit the Golden Temple in Amritsar. Upon my arrival at the Harimander Sahib, the Guru determined that I was in desperate need of some serious cleansing, because I became violently ill. However, the task of the yatra for me was to “keep up.” I was blessed to be able to proceed, feeling uncomfortable, but still blessed. After touring many holy places during the 40-day trip, our final stop was Anandpur Sahib. From Sikh history, I knew that this was the birthplace of the Khalsa, where Guru Gobind Singh had asked for the heads of five brave Sikhs. The Siri Singh Sahib had told us that many of us had run away when asked for such a sacrifice, noting that he thought that many American Sikhs had been there with Guru Gobind Singh in a past life and were now reincarnated as Sikhs in order to be given another chance to stand with their Guru. During my trip, I felt so blessed each time I was able to bow my head before the Guru to make an offering and say a silent prayer for healing, strength, forgiveness, and to cover all of my many faults. At the beautiful gurdwara at Keshgarh Sahib, as I shuffled forward towards the Guru Granth Sahib, I found that no prayer came into my conscious awareness. Here was an opportunity to speak of my love and my “commitment” to the Guru, yet no words were coming. Nothing. My mind was a spinning blank. As I approached the Guru, I thought I would panic. This was my chance to speak to the Guru, and I was as mute as a stone, my mind blank. Finally, I stood before the Guru, my hand clasping a humble bunch of rupees. I tossed them to join their compatriots at my feet. And all I could do was fall to grab the floor and put my head on the cool marble. It was then that I heard a strong voice speak in my ear. (It was not the Siri Singh Sahib, nor anyone I could recognize.) The voice said, “You will never leave me again.” Those few words, six in all, have stayed with me in the years since. I have never forgotten them through triumph and crisis, and I know I will never turn my back on the Guru. I ought to mention that the song Flowers in the Rain by SS Gurudass Singh always had a powerful effect on me even before visiting India. The refrain, “Many did they run away and many did they hide, but those who gave their lives to Him their souls were glorified,” always managed to send a chill or a thrill up my spine. It was a deep experience for me to know a possible explanation. The spiritual path, I guess, is deep and wide, carrying us towards our destiny whether we like it or not. 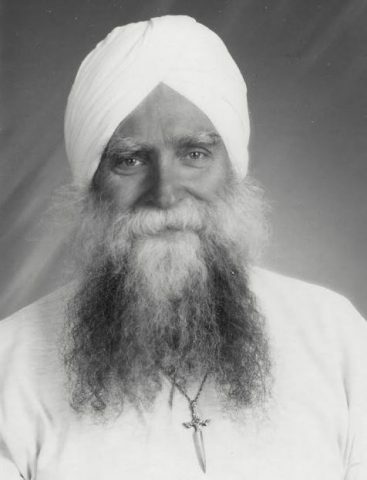 SS Karta Purkh Singh Khalsa is an ordained Sikh Dharma Minister. He is Director of the 3HO Kundalini Yoga Center of Missouri, Inc. appointed by the Siri Singh Sahib in 1980. Trained in Kundalini Yoga and Meditation by Yogi Bhajan, he has taught Kundalini Yoga in prisons, community centers, and gyms since 1976. He is a founding member of the Greater Kansas City Interfaith Council and serves on its board, representing the Sikh faith. He is a certified Kundalini Yoga Teacher, a member of IKYTA, and a KRI-certified Kundalini Yoga Teacher Trainer for Levels I and II. He serves as an Adjunct Professor at the University of Missouri, Kansas City, teaching two one-hour credit courses in Kundalini Yoga & Meditation, in the Phys-Ed & Psychology and Counseling departments. Karta Purkh Singh is a published writer and an award-winning photographer.